Taking a break from baking, Johana shares a happy moment with her daughter, Juniesky, who is sponsored through Unbound. Being released from the anxieties of poverty liberates people in more ways than one. It allows them to be more generous with those around them and gives them permission to dream big dreams. That is how it was for Johana when her daughter, Juniesky, became sponsored through Unbound. Now 15, Juniesky has had a sponsor since 2011. The family lives in Nicaragua. Johana was 18 when her daughter was born. A son, Luis, now 12, came along two years later. Both children had health problems. Though Johana’s husband, Luis Alberto, works hard as a bus driver, what he was able to earn wasn’t enough to support the family and provide for the children’s medical care. When Unbound staff became aware of their situation, they asked Johana and Luis Alberto if they would like for Juniesky to be sponsored. Having heard about the benefits of sponsorship from other families in their community, they eagerly agreed. That support didn’t only benefit the children. Johana became a member of the local Unbound mothers group, which brought her not only new friends but also new ambitions. Like many Unbound parent groups, the one that Johana belongs to is working together to generate creative sources of income. With some coaching from local Unbound staff, they developed a plan to open a bakery. Slowly but surely that dream is becoming reality. With some seed money from Unbound, the mothers have now purchased some of the baking equipment they will need. The biggest item they’ll need is an oven, and they are focused on acquiring one. 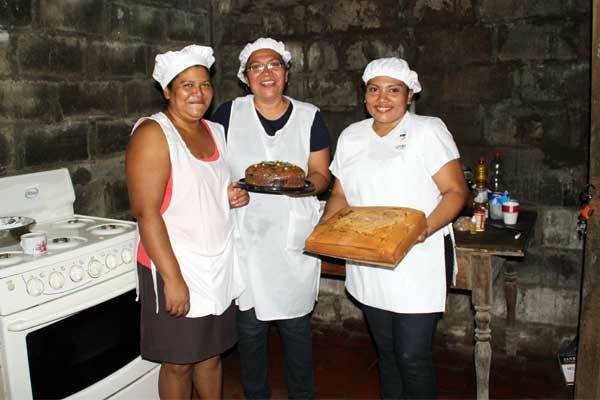 “We don’t yet have enough money to buy a professional oven, but we keep doing activities to raise money,” Johana said. Those activities, which include honing their baking skills and selling what they create, have turned out to be as enjoyable as they are profitable. Johana (right) and two other members of her mothers group, Jadira (left) and Janeth (center), proudly display cakes ready to be sold. Now freed from the burden of constant worry about her children, Johana is enjoying life in a way she never thought possible. She and her friends have discovered, within themselves and each other, the joy of sharing a dream. “I feel happy,” she said. “This is something that not only I like but all the mothers like. We talk, we share and that’s what we like about the bakery. We are a very close group. It seems that Johana and her group have found the right recipe. Learn more about the creative ways Unbound is helping mothers and other groups generate income and how you can help support our efforts. It is so wonderful to see how much your family has accomplished!